Shazam Lite APK has been released and now the latest version is 1.0.0-161005. If you have never heard about Shazam, it’s an application that can help you identify songs when you hear it. You don’t have to fret anymore when you hear that nice beats and don’t know the title of it. With a single tap, Shazam can connect to the Internet, recognize the song, and churn out the title as well as the artist behind it. For music lovers, this application is very essential. However, many users have reported its laggy performance on older phone versions and slow Internet in some areas. With the Lite version, which is lighter in terms of its small installation size and also its performance, these problems can be solved. With lighter installation size, it means this application will occupy less space in your phone’s memory. Downloading this application will be very fast. After installation, opening this app on your phone won’t result in lagging. This is a nice solution for older phone versions which don’t have the capacity to operate heavy mobile applications that finally can result in unwanted system crashes. Another plus of this light app is the ability to save the song. For example when you are out of your network area and want to identify a song, you can just tap the icon and this app will save the song for you. The application will identify and give you the name of the song once you are connected to the Internet. This means finding music that you love won’t be so hindered by network connection anymore. Shazam works very well if you are not in fast connection area. It is able to work in areas with 3G and even 2G networks to help you identify the songs. 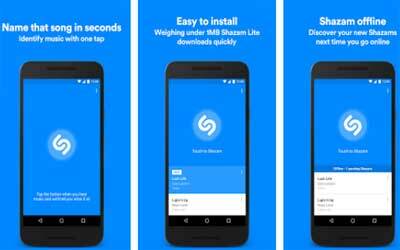 Although Shazam Lite for Android lacks some features that exist in the Shazam app like access to song lyrics, music streaming, and video clips, it is more than enough and the lightness is worth the features. It is such an important application to use on the go wherever, whenever to recognize any unknown music playing around. Now it comes under 1 MB. Excellent work. Light weight. Consuming incredibly less amount physical memory of the device.